“Mulo Francel and Friends.” The name might suggest a hastily assembled pick-up band. But this group, based in Munich, knows its repertoire from deep and plays it almost entirely from memory. It proved a very committed and thoroughly played-in unit. With gentle irony they declared themselves proud to have made the journey together all the way up to the German capital. It is a group which has many ways of pleasuring the listener with melody. Band-leader Mulo Francel (tenor and soprano sax, and clarinet) talked about how they occupy the area between jazz and world music, but perhaps the most interesting thing about these four friends is that they bring such different musical heritages to this band. Possibly the most unusual heritage is that of pianist David Gazarov. He is originally from Baku in Azerbaijan. He is from the same generation of Baku-born musicians as pianist Amina Figarova and singer-pianist Aziza Mustafa Zadeh, but he is of Armenian heritage, a minority group in Azerbajjan, and left for Moscow as a young man . 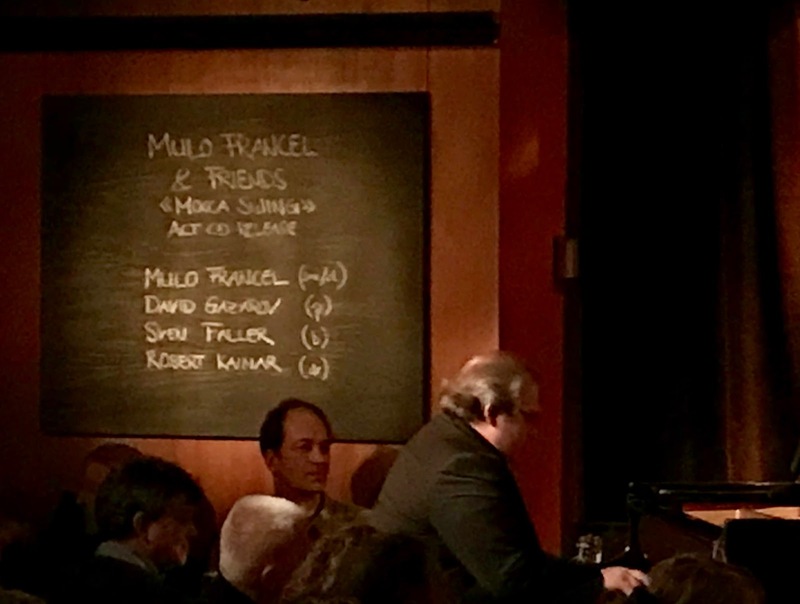 He has now been a major presence on the scene in Munich for over a quarter of a century, and last night demonstrated that he is equally grounded in Chopin and in Bill Evans. He can go off into solo peregrinations from either starting-point, but is also a major asset in a band as the conversation expands and the intensity builds. "Story-teller" is one of the most overworked metaphors in music, but Sven Faller genuinely, literally is one. He has published a personal memoir of short prose pieces entitled Night Music, which takes a wry look at some of the curious characters he met in his time playing in New York, and also explains some of the ironies, discontinuities and unexpected twists in his own family history. His narrative craft comes across well in this book, just as it does in an interview from 2014 with him that Alison Bentley did for us about his role as bassist in Elf Trio, and in the fascinating introductions he made to his own tunes. And, yes, his playing tells a story too. 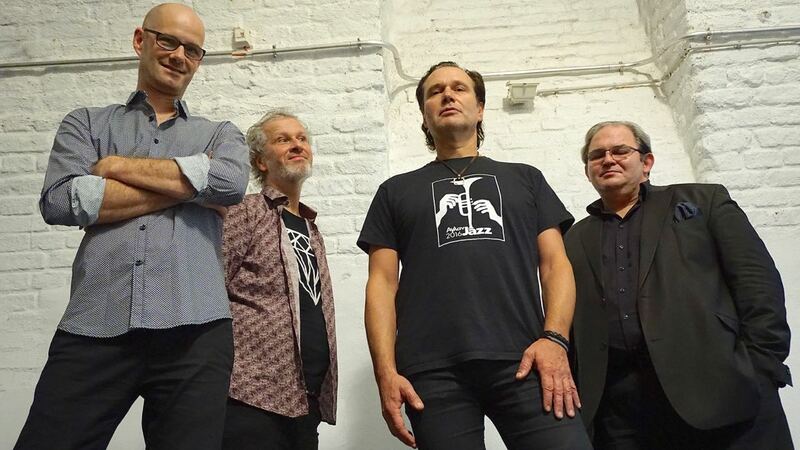 Robert Kainar from Salzburg is a top-flight drummer, full of creative ideas. One of those tunes from Sven Faller, Laqueur, brought a real highlight of the evening. Mulo Francel switched from the tenor saxophone, where he mostly plays in a muscular extrovert style, but can also do an Ike Quebec-ish ballad, and from fast-flowing and fluent soprano sax to the clarinet. This was where he really shone. He has a really special sound on the instrument, with a beautifully focused tone, which – counter-intuitively – is particularly rich in the throat register. He plays all kinds of chromatic enclosures, as if inspired by the central European tárogató players. Dave Gelly has described the "disarming" charm of the album well in his Observer review. I just wish we could have heard more of Francel on the clarinet.